2 About the Author E.B. White Reading a story like Charlotte’s Web, can put thoughts into a readers mind; thoughts of allegory, symbolism, and character analysis. However, E.B. White had not intended such thoughts, as he wrote this impeccable story. 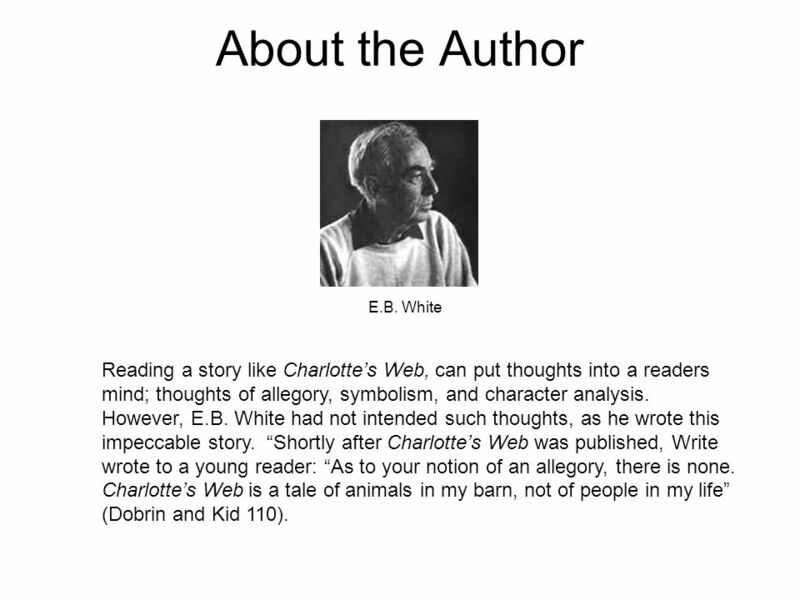 “Shortly after Charlotte’s Web was published, Write wrote to a young reader: “As to your notion of an allegory, there is none. Charlotte’s Web is a tale of animals in my barn, not of people in my life” (Dobrin and Kid 110). Sounds similar to Lewis’ statements, doesn’t it? E.B. White Awkward title. White’s stories are not based on factual events: “they are imaginary tales, containing fantastic characters and events” (White). 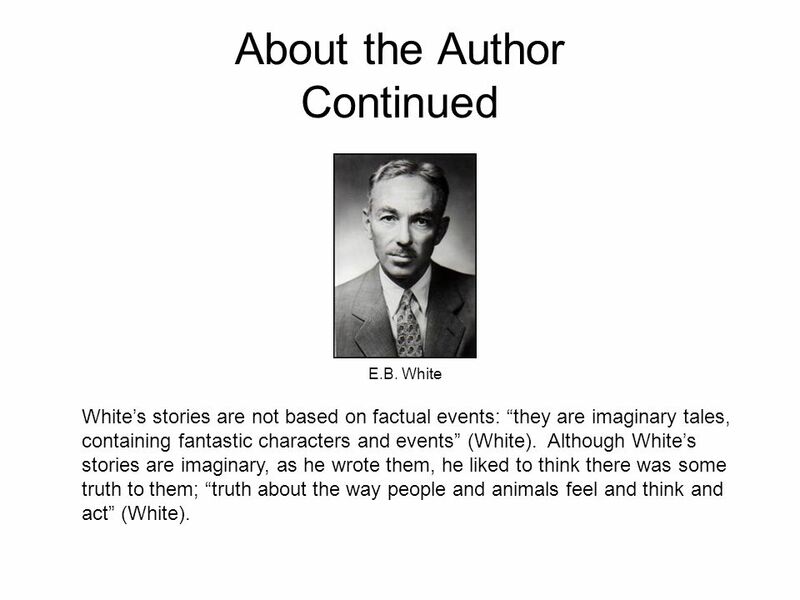 Although White’s stories are imaginary, as he wrote them, he liked to think there was some truth to them; “truth about the way people and animals feel and think and act” (White). 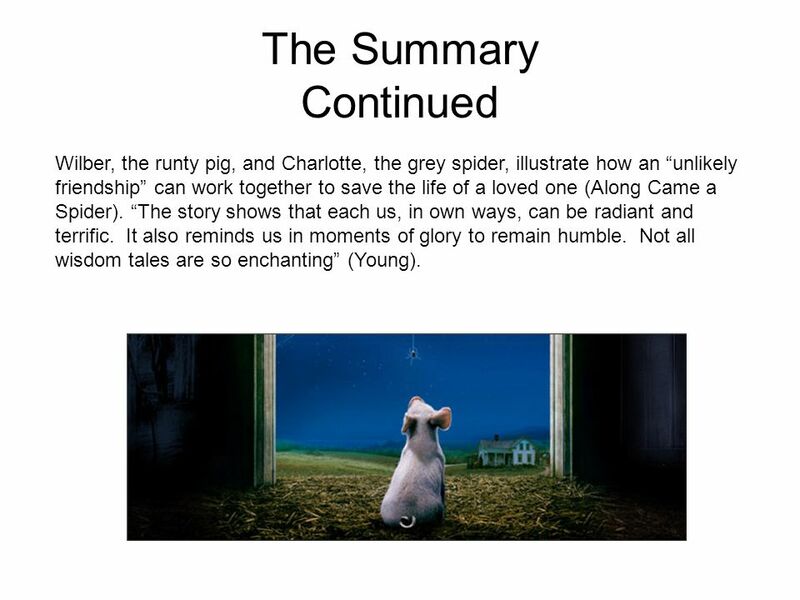 5 The Summary Continued Wilber, the runty pig, and Charlotte, the grey spider, illustrate how an “unlikely friendship” can work together to save the life of a loved one (Along Came a Spider). “The story shows that each us, in own ways, can be radiant and terrific. It also reminds us in moments of glory to remain humble. Not all wisdom tales are so enchanting” (Young). “You have been my friend, replied Charlotte. That in itself is a tremendous thing” (White 164). When Wilber is placed into Zuckerman’s barn, he is surrounded by loneliness. A tiny voice appears out of nowhere stating: “Do you want a friend, Wilber? I’ll be a friend to you” (White 31). “The lonely pig is befriended" (Charity). Charlotte being a blood sucking spider intimidates Wilber at first, causing him to second guess their ability to be friends. 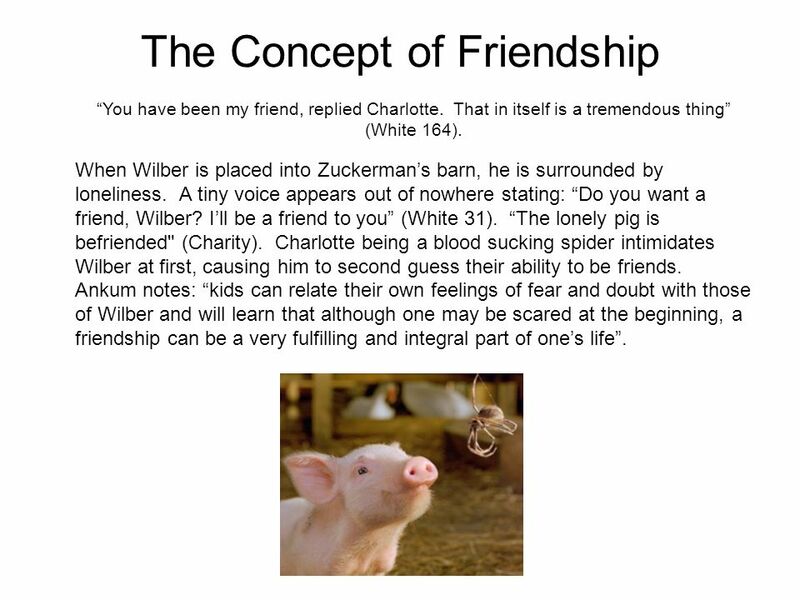 Ankum notes: “kids can relate their own feelings of fear and doubt with those of Wilber and will learn that although one may be scared at the beginning, a friendship can be a very fulfilling and integral part of one’s life”. The friendship between Charlotte and Wilber is like no other; not only do they share an unbreakable bond, they establish a friendly environment within the barn, that would have otherwise not been. White mentions “no pig ever had truer friends, and he realized that friendship is one of the most satisfying things in the world”. 8 The Concept of Love “But you have saved me, Charlotte, and I would gladly give my life for you- I really would” (White 164). The love that is represented between Charlotte and Wilber is undeniable. 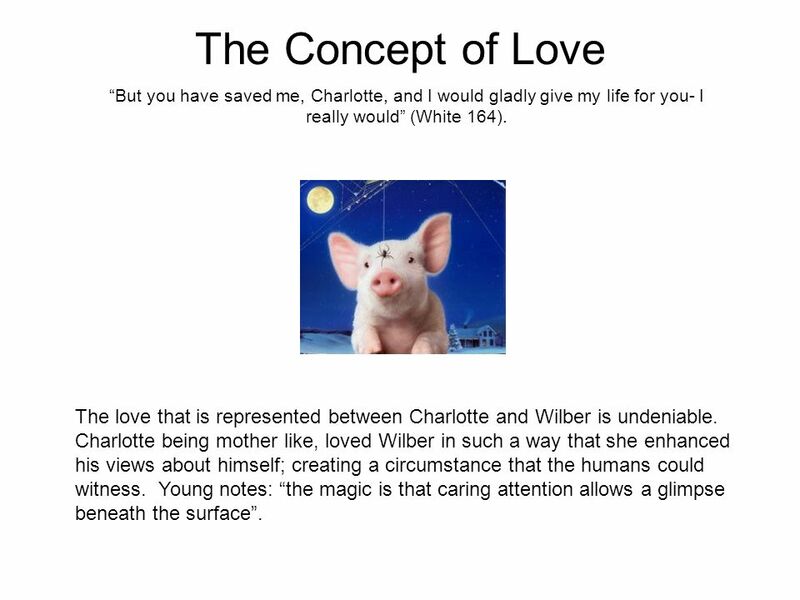 Charlotte being mother like, loved Wilber in such a way that she enhanced his views about himself; creating a circumstance that the humans could witness. Young notes: “the magic is that caring attention allows a glimpse beneath the surface”. 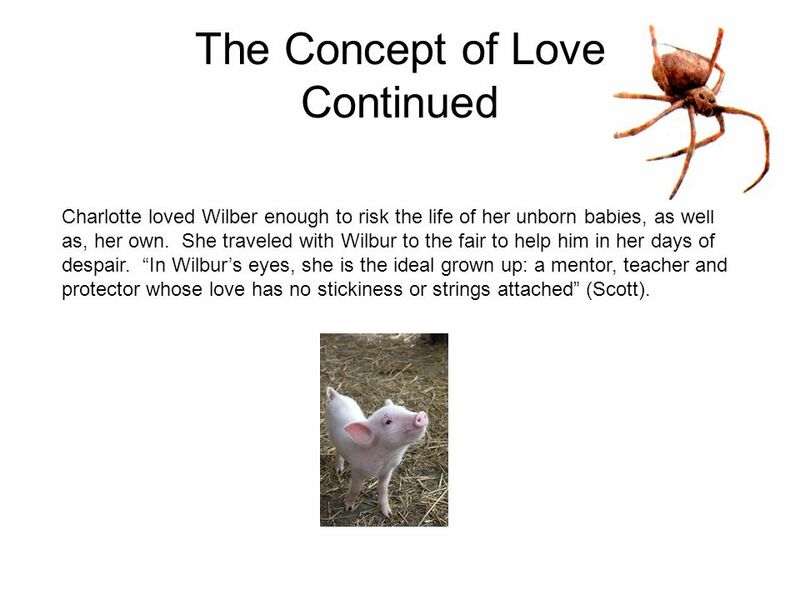 Charlotte loved Wilber enough to risk the life of her unborn babies, as well as, her own. She traveled with Wilbur to the fair to help him in her days of despair. “In Wilbur’s eyes, she is the ideal grown up: a mentor, teacher and protector whose love has no stickiness or strings attached” (Scott). “After all, what’s a life, anyway? We’re born, we live a little while, we die” (White 164). When Wilbur’s fate is mentioned, he is in a terrified state; running around screaming “I don’t want to die” (White 50). “Charlotte manages to calm Wilbur in the face of looming slaughter. Coping with our fear of death is a challenge”; especially for children (Young). 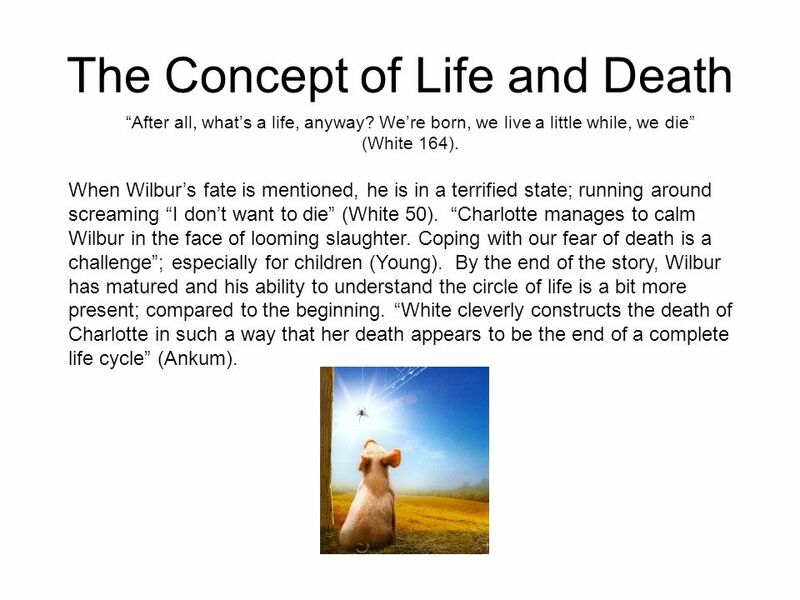 By the end of the story, Wilbur has matured and his ability to understand the circle of life is a bit more present; compared to the beginning. “White cleverly constructs the death of Charlotte in such a way that her death appears to be the end of a complete life cycle” (Ankum). Although Charlotte was no longer in the physical presence, Wilbur never forgot her. “Charlotte is, in away, dead, but undying; she is held in the web of memory” (Thacker and Web 129). White notes: “Each spring there were new little spiders hatching out to take the place of the old”. 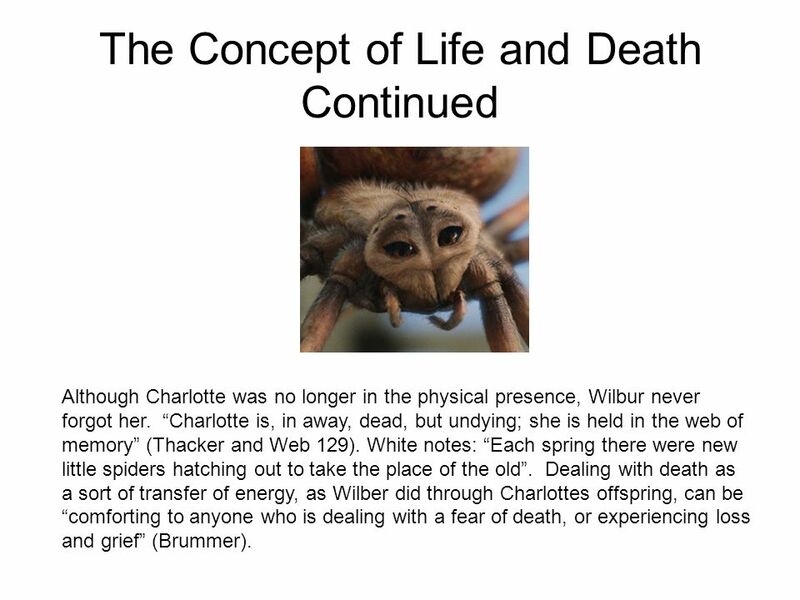 Dealing with death as a sort of transfer of energy, as Wilber did through Charlottes offspring, can be “comforting to anyone who is dealing with a fear of death, or experiencing loss and grief” (Brummer). 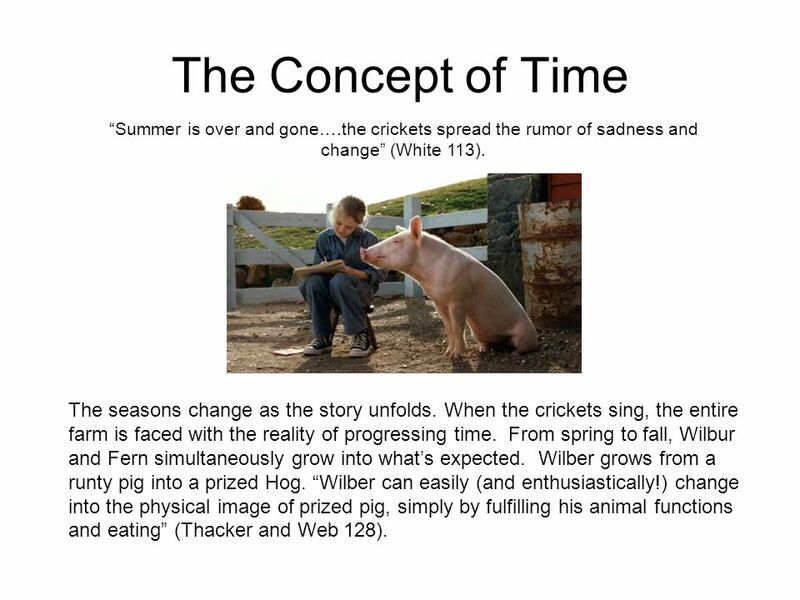 12 The Concept of Time “Summer is over and gone….the crickets spread the rumor of sadness and change” (White 113). The seasons change as the story unfolds. When the crickets sing, the entire farm is faced with the reality of progressing time. From spring to fall, Wilbur and Fern simultaneously grow into what’s expected. Wilber grows from a runty pig into a prized Hog. “Wilber can easily (and enthusiastically!) 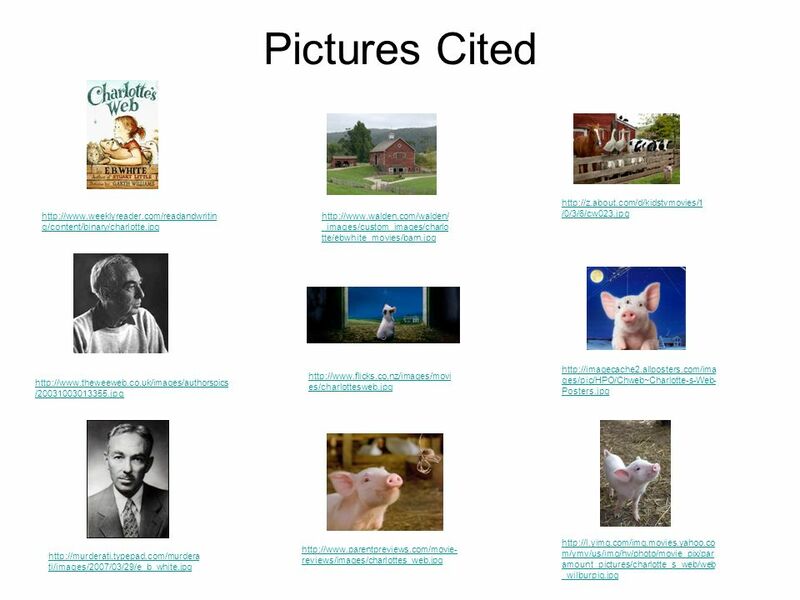 change into the physical image of prized pig, simply by fulfilling his animal functions and eating” (Thacker and Web 128). 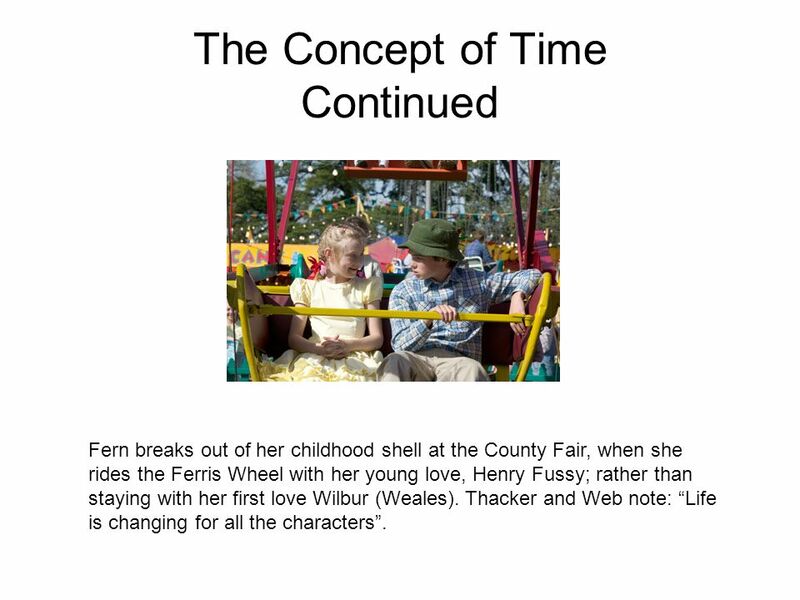 Fern breaks out of her childhood shell at the County Fair, when she rides the Ferris Wheel with her young love, Henry Fussy; rather than staying with her first love Wilbur (Weales). Thacker and Web note: “Life is changing for all the characters”. 14 The Concept of Faith “When the words appeared, everyone said they were a miracle. 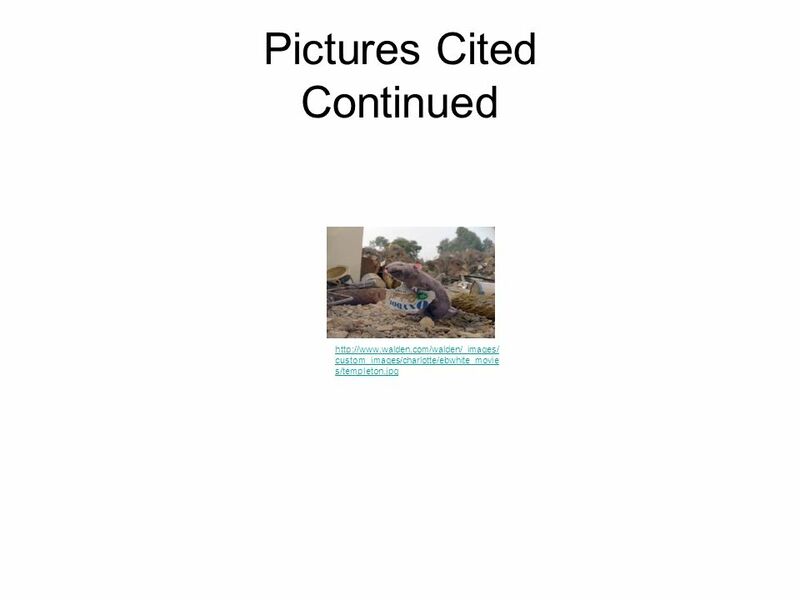 But nobody pointed out that the web itself is a miracle” (White 109). 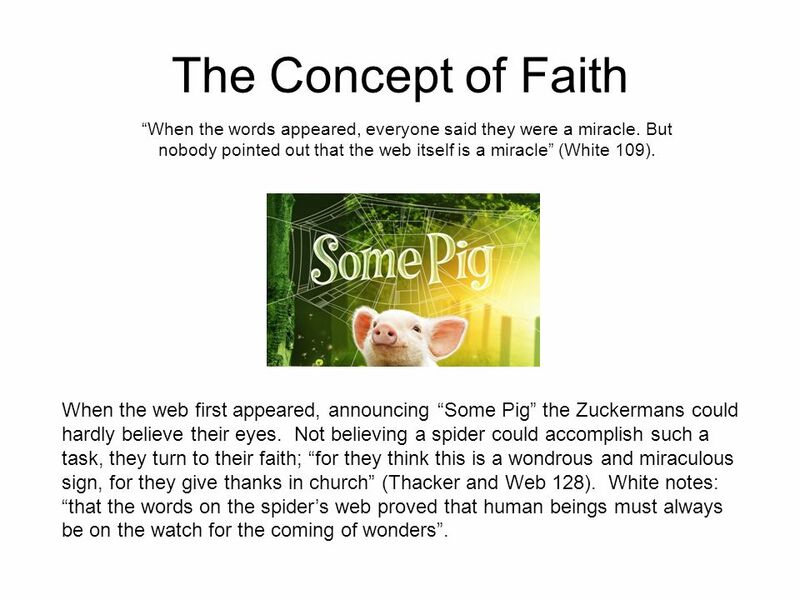 When the web first appeared, announcing “Some Pig” the Zuckermans could hardly believe their eyes. Not believing a spider could accomplish such a task, they turn to their faith; “for they think this is a wondrous and miraculous sign, for they give thanks in church” (Thacker and Web 128). White notes: “that the words on the spider’s web proved that human beings must always be on the watch for the coming of wonders”. “But I’m not terrific, Charlotte…..You’re terrific as far as I’m Concerned” (White 91). 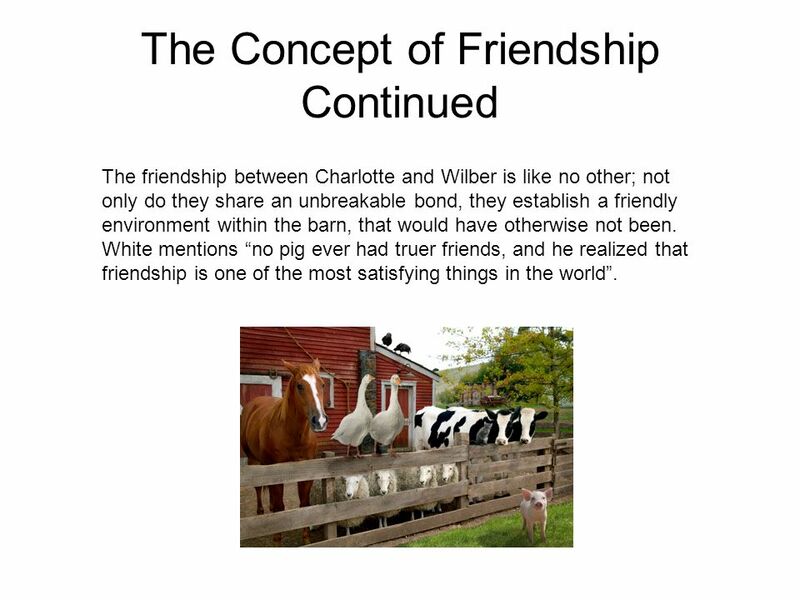 The friendship and bond between Wilbur and Charlotte provide guidance to Wilbur's identity. “The story reminds us that identity is formed in relationships” (Young). 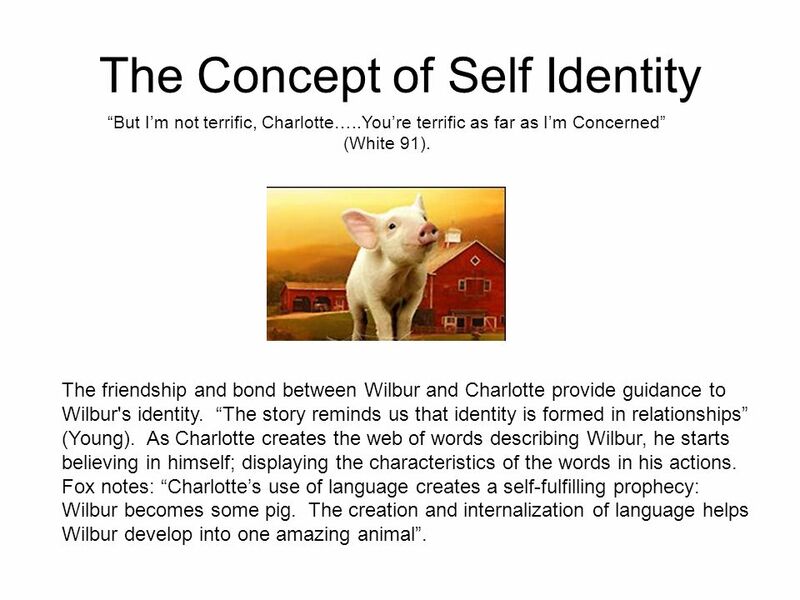 As Charlotte creates the web of words describing Wilbur, he starts believing in himself; displaying the characteristics of the words in his actions. Fox notes: “Charlotte’s use of language creates a self-fulfilling prophecy: Wilbur becomes some pig. The creation and internalization of language helps Wilbur develop into one amazing animal”. 16 The Concept of Greed “Well, I hope you’re satisfied,…I’m not going to spend all my time fetching and carrying. I came to this Fair to enjoy myself, not to deliver papers” (White 140). From the beginning of the story, Templeton is open about his feelings: “I prefer to spend my time eating, gnawing, spying, and hiding. I am a glutton but not a merrymaker” (White 29-30). 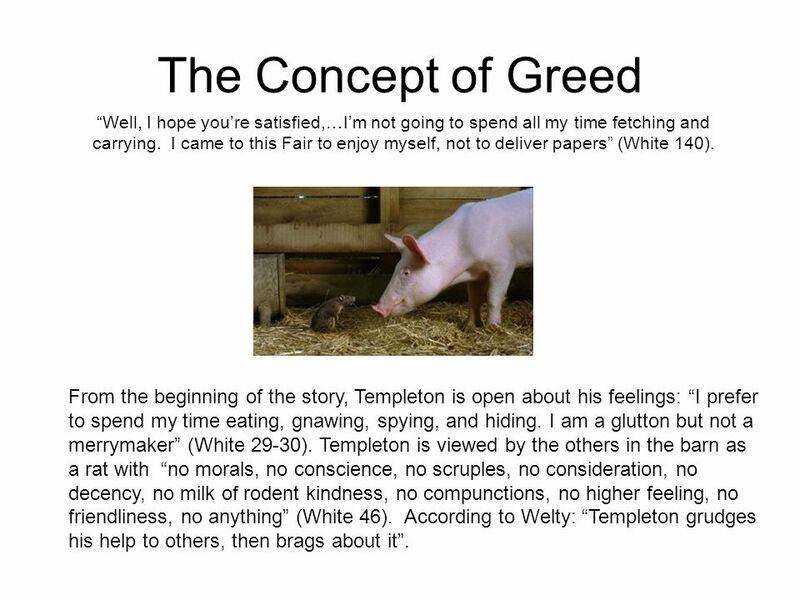 Templeton is viewed by the others in the barn as a rat with “no morals, no conscience, no scruples, no consideration, no decency, no milk of rodent kindness, no compunctions, no higher feeling, no friendliness, no anything” (White 46). According to Welty: “Templeton grudges his help to others, then brags about it”. When it comes to helping Charlotte save Wilbur, Templeton is clear about his feelings: “Let him die, I should worry” (White 90). It isn’t until food is mentioned that Templeton is willing to help. 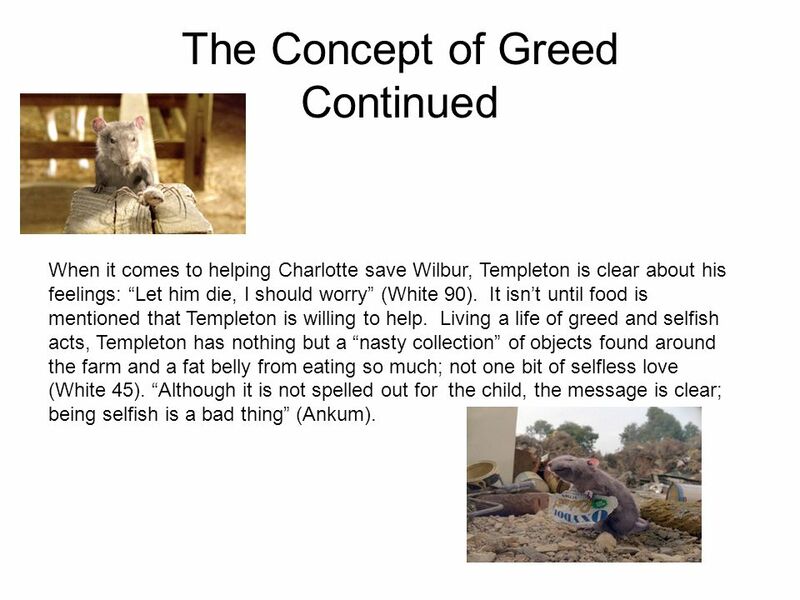 Living a life of greed and selfish acts, Templeton has nothing but a “nasty collection” of objects found around the farm and a fat belly from eating so much; not one bit of selfless love (White 45). “Although it is not spelled out for the child, the message is clear; being selfish is a bad thing” (Ankum). 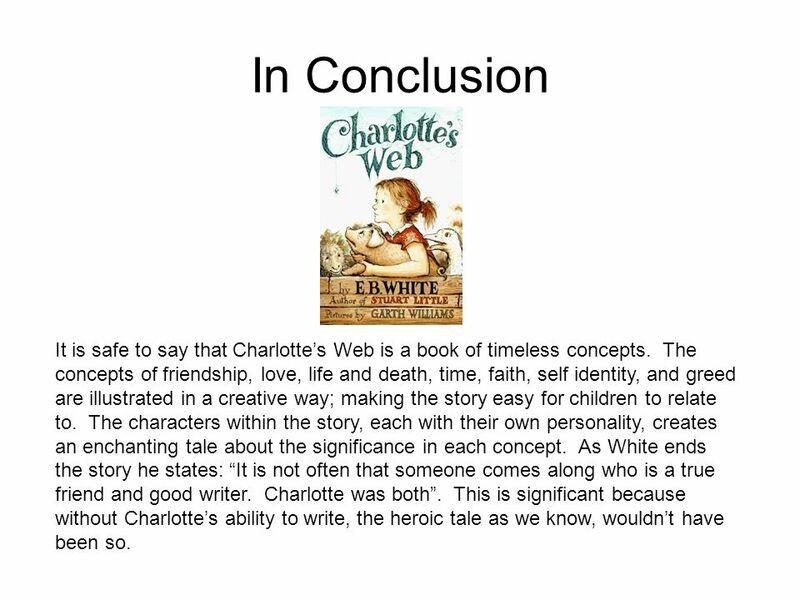 18 In Conclusion It is safe to say that Charlotte’s Web is a book of timeless concepts. The concepts of friendship, love, life and death, time, faith, self identity, and greed are illustrated in a creative way; making the story easy for children to relate to. The characters within the story, each with their own personality, creates an enchanting tale about the significance in each concept. As White ends the story he states: “It is not often that someone comes along who is a true friend and good writer. Charlotte was both”. This is significant because without Charlotte’s ability to write, the heroic tale as we know, wouldn’t have been so. 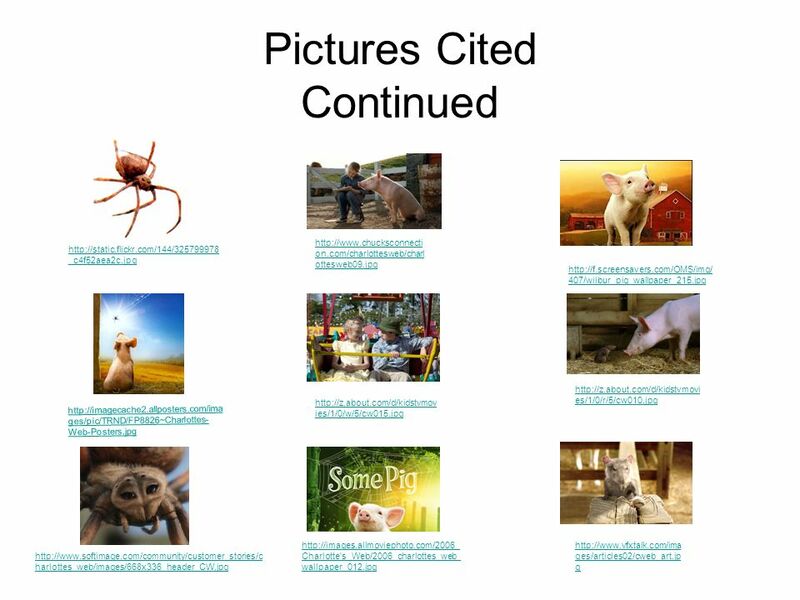 19 Works Cited White, E.B.. Charlotte's Web. New York, NY: Harper Collins Publishers, 1952. Dobrin, Sidney I., and Kidd. Wild Things: Children's Culture and Ecorcriticism. Detroit, Michigan: Wayne State University Press, 2004. Thacker, Deborah C., and Webb. Introducing Children's Literature: From Romanticism to Postmoderism. London & New York: Routledge, 2002. Scott, A.O.. "White." 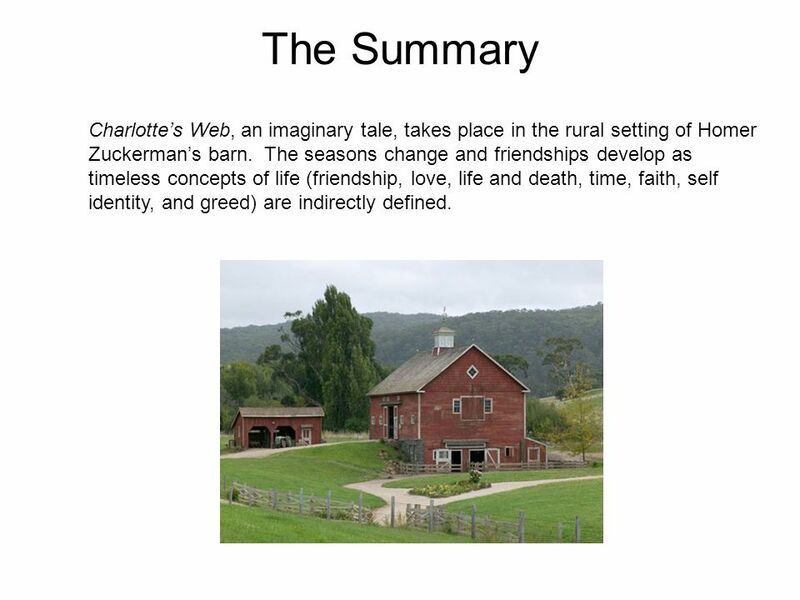 The New York Times 15Dec Jul 2008 < Ankum, Anita V.. "Charlotte's Web: The Purpose of the Animal Story." Jul Jul 2008 < Weales, Gerald. "The Design of E.B. White." 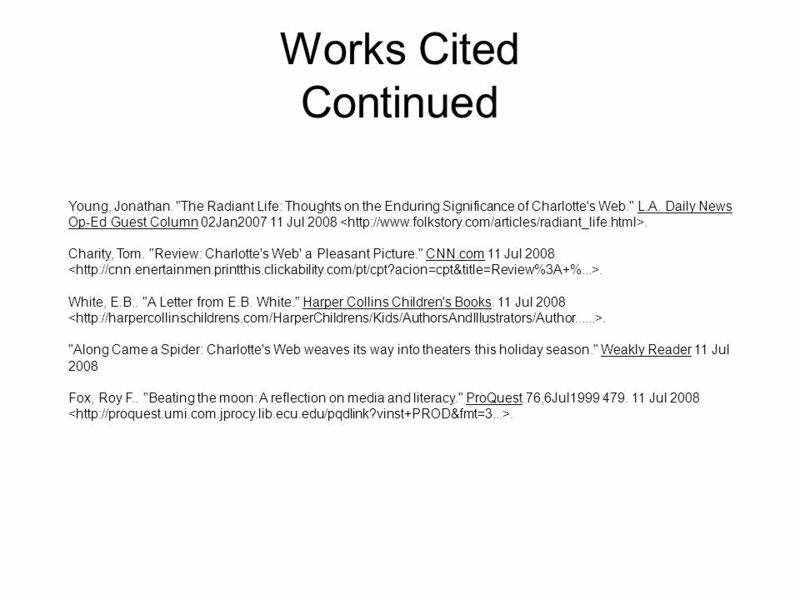 The New York Times on the Web 24May Jul 2008 < Welty, Eudora. "Life in the Barn Was Very Good." The New York Times on theWeb 19OCT Jul 2008 < Brummer, Shawn M.. "Life Lessons from a Cow." The Bismark Tribune 13Jul Jul 2008 < Great research. Well done. An A-paper is extraordinary work that more than fulfills the requirements of the assignment. This essay tackles the topic in an innovative way, with a clear sense of audience and purpose, an insightful thesis, and an appropriate and effective organization. The structure is carefully planned; each section of the essay develops the thesis with logical arguments and specific, conclusive evidence which has been interpreted and clearly related to the writer's point. The style is energetic and precise: the sentence structure is varied and the words are carefully chosen. How the writer says things is as excellent as what the writer says. 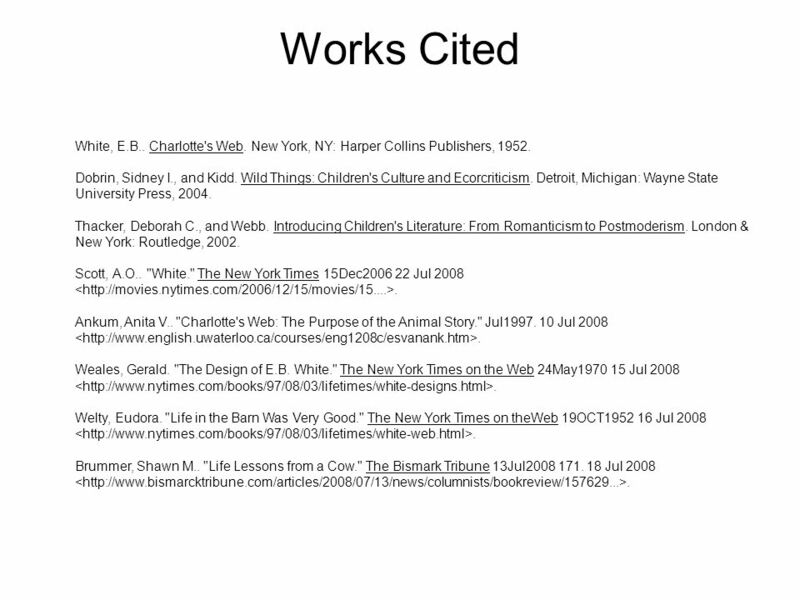 There is evidence of careful editing since the essay contains few grammatical and/or mechanical errors and, if necessary, is correctly documented using MLA format. 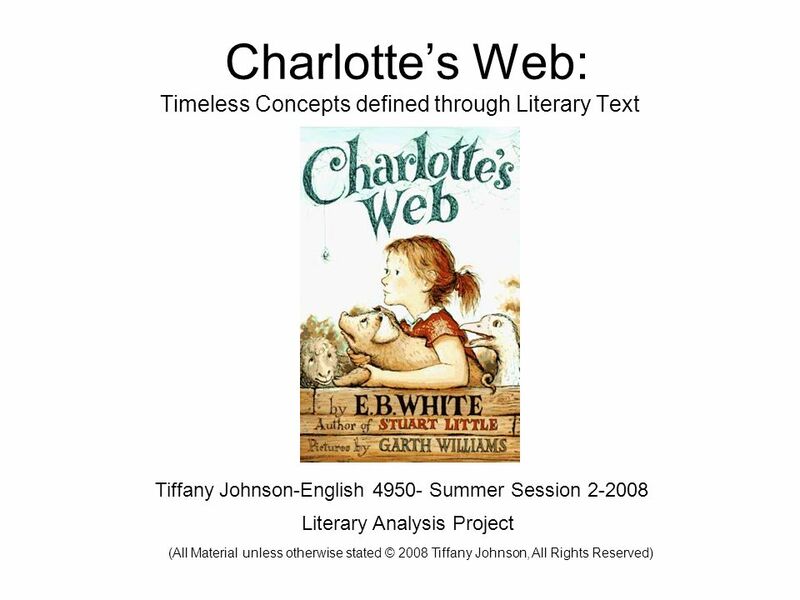 Download ppt "Charlotte’s Web: Timeless Concepts defined through Literary Text"
Miss Martonys Class Characters Literary Elements Quotes Miscellaneous. A PowerPoint for *****!! *photo of young person*. I DENTITY I N C HRIST. Who Am I? clips/nanny-diaries/who-am-i. Charlotte’s Web Brenda M. Martinez Brenda M. Martinez Professor: Evelyn Lugo Professor: Evelyn Lugo Class: ENGG 633 Class: ENGG 633. The Big event is sponsored by: Can a Personal Budget Make a Difference to Transition for Young Disabled People? Paul Connolly –In Control and Senior Practioner.  10 Reasons I'm Passionate about Young Adult Literature. Our Christian values These are our central values. In the Bible we learn about the kind of people God wants us to be. At school, we try to put these values. Charlotte’s Web By: E.B. White Illustrated by: Garth Williams Belnap2100Final. THIS IS With Hosts... Your Going to the Fair All About Charlotte Spider Facts Number Facts Vocabulary Who Said That? Name that.